(Neptune City, NJ, April 26, 2018) – In the midst of an opioids epidemic in which even the home medicine cabinet can become an easy target for substance misuse, Horizon Blue Cross Blue Shield of New Jersey (Horizon BCBSNJ) has joined with Walgreens to help make it simple and convenient for the public to get rid of unwanted, unused or expired medications. 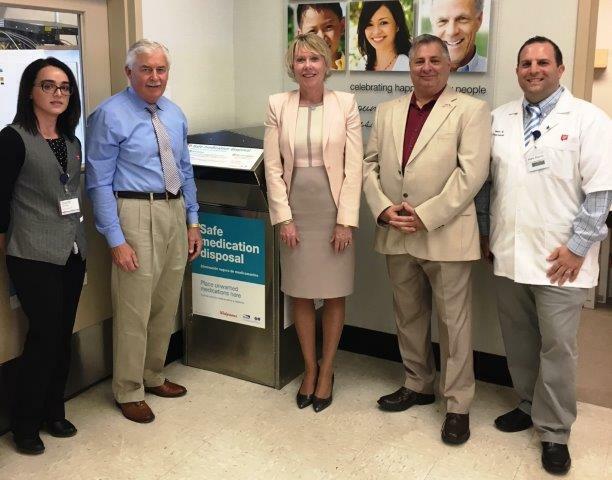 New Jersey residents can now safely dispose of unwanted prescriptions, including controlled substances and over-the-counter medications, year-round in safe medication disposal kiosks available at 16 select Walgreens locations throughout New Jersey. Horizon joined Walgreens and local elected officials at the Walgreens store at 1905 Rt. 33 in Neptune City, which is one of 16 new locations in New Jersey – and part of a national expansion nationwide – to raise public awareness to the everyday option for safe medication disposal. 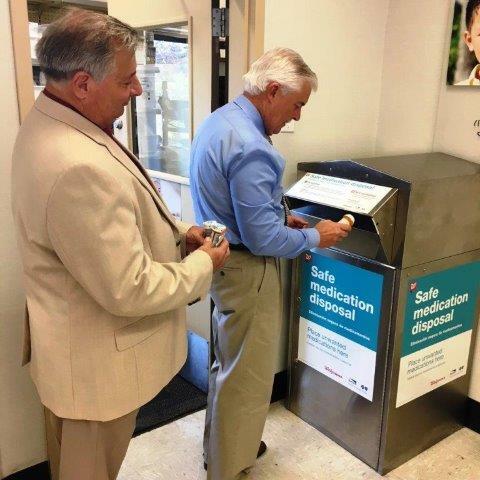 Mayor Nicholas Williams of Neptune Township (L) and Assemblyman Eric Houghtaling drop off unwanted prescription medications into the safe disposal kiosk at Walgreens. Walgreens is in the process of expanding its safe medication disposal kiosks to an additional 900 locations. When the expansion is complete, kiosks will be available in 1,500 Walgreens locations across the country. Since the program began, Walgreens has collected more than 270 tons of unwanted medication. Monmouth County Assemblyman Eric Houghtaling today joined Horizon and Walgreens in helping promote the availability of the new safe drug disposal option in Neptune. “Addiction often begins with a prescription and is fueled by the medicine cabinet. Whether patients are over-prescribed an opioid medication that leads to dependency or a family member abuses medications that are not theirs, New Jersey’s medicine cabinets are veritable one-stop-shops for addiction. That is why it is so important that companies like Horizon Blue Cross Blue Shield of New Jersey and Walgreens give New Jerseyans a safe and easy way to responsibly dispose of their unused or leftover medications,” Assemblyman Houghtaling said. Carlstadt, East Brunswick, East Orange, Elizabeth, Elmwood Park, Hamilton, Jersey City, Millville, Parsippany, Pennsauken, Perth Amboy, Somerville, Toms River, Union and Waldwick.